Jonathan Trott should not be opening the batting for England after his third duck in five innings during the tour of West Indies, says Geoffrey Boycott. He lasted just three balls of the third Test in Barbados before being caught. 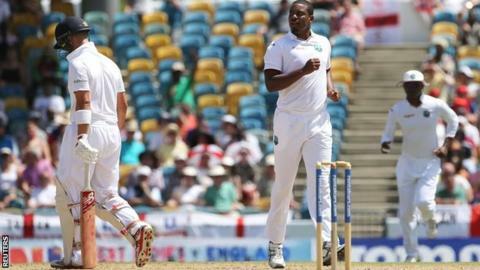 Former England batsman Boycott said: "Trott's a problem, he's coming forward before the bowlers let the ball go. "It's not the way he used to play and for me he would not be opening. There are sterner tests to come after West Indies with New Zealand and Australia." Trott, 34, has a Test average of 44 runs and has played most of his England career at number three in the batting order. He was recalled to the Test side for the trip to the Caribbean after leaving the 2013-14 Ashes series in Australia with a stress-related illness. "I feel for Jonathan Trott. He shouldn't be opening the batting, he's a number three. It almost seems like a sympathy pick to me." But he has now become the third England opener to register three ducks in five innings, one of the others being Boycott himself. And his dismissal is likely to lead to calls for uncapped Yorkshire left-hander Adam Lyth, who scored 1,489 runs in the County Championship last summer, to replace him as opener. A half-century in the second Test has been Trott's only success on the tour so far as England chase a 2-0 victory in the three-Test series. Boycott told Test Match Special: "You can get away with [coming forward] if the bowlers are medium paced, but when you get faster bowlers you haven't got time and you're not in any control. "He is a tough cookie and he has had a terrific Test record. But it's a different ball game psychologically up front. It's not like being down the order and you have plenty of runs on the board and the bowlers are tired. Every time you go in it's the new ball and you have got fresh bowlers. It is nerve-wracking. "He can't play like that against quick bowling. I would be frightened watching him when Australia come [for the Ashes series this summer] with Mitchell Starc and Mitchell Johnson." England's first home Test of the summer is against New Zealand at Lord's and begins on 21 May. The opening Test against Australia starts at Cardiff on 8 July.